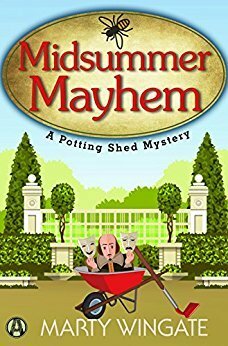 Midsummer Mayhem by Marty Wingate – Books, Books and More Books! Pru Parker, gardener extraordinaire, is in the thick of things again. The entire town is excited about the news of an outdoor performance to be put on at a beautiful local estate with gardens to die for. Literally. Pru is to be the plant set director and along with her helper, Hal, she hopes to do the play justice and keep the actors from destroying the gardens. Which is the reason the normal gardener for the estate abruptly quit! As she races from one errand to another, she creates scenes for each act of the play, A Midsummer Night’s Dream. When one of the actors is found dead among bees, everyone becomes a suspect. Pru’s hubby, DI Christopher Pearse is on the case and is hoping Pru can ferret out any gossip or clues from the cast. The only problem is they all seem suspect! Secrets abound and Pru may not live to see the play! A lovely cozy series that I hope to read more of! I hardly ever read mysteries but your review and the lovely book cover have swayed me. I am glad to see this one is a good addition to the series. The last one was just meh for me, so I am looking forward to this one getting back on track. Nice review.